Currently over 300 3rd-8th grader students are enrolled in the YAM afterschool program offered at six elementary schools and one middle school in Pickens County. Also offered is a YAM Evening Music Program for anyone from third grade to adult who wants to learn to play an acoustic instrument in the traditional way, by ear. Classes include guitar, mandolin, fiddle and banjo. Many students could not afford the level of instruction they receive or to try out an instrument without a program like YAM. The program offers affordable instruction, including lower rates for free and reduced-lunch students, as well as an instrument rental program that makes it possible for all children to play an instrument. None of this would be possible without the support of the community. 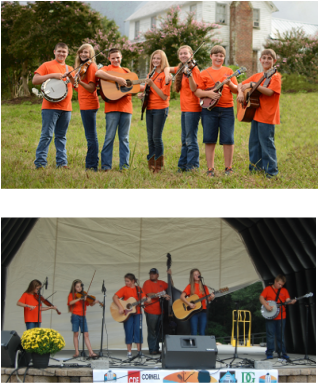 In March of 2010, POSAM (Preserving Our Southern Appalachian Music) initiated its performing band, Sweet Potato Pie Kids, which is made up of top students in the YAM program. These students must be recommended by their instructors and are then scheduled for audition. The current band is made up of seven students. The purpose of the band is to promote POSAM and the YAM program while raising funds for the entire nonprofit organization. Last year, they performed in over forty venues. The group has become a popular attraction in Pickens County. The program currently has two performing Sweet Potato Pie Kid bands. The senior band consists of mostly 8th grade students that will be aging out of the band in May 2015. The junior band is in training and will be performing on a more regular basis in June 2015.